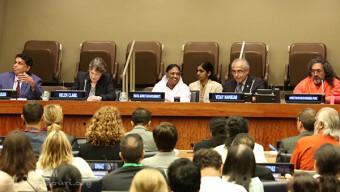 Excerpts from the keynote address Sri Mata Amritanandamayi Devi (Amma) gave at the United Nations Academic Impact – START/Amrita University Conference on Technology for Sustainable Development. The full speech on “Reconciling Ancient Spiritual Wisdom And Modern Technology For Societal Transformation” is available at amritapuri.org. Just as our right hand rushes to comfort our left hand if it is in pain, may we love and serve others as we would our self. I often reflect deeply on the future of the Earth, the preservation of nature, and the disappearing harmony between humanity and nature. This contemplation has led me to the conviction that science, technology, and spirituality must unite in order to ensure a sustainable and balanced existence of our world. The present age and the world around us demand this transformation. People ask, “What is the significance of spirituality?” Spirituality helps us to develop the discernment to differentiate between what is essential and what is excessive. For example, we need a watch to tell time. Both a $100 and a $50,000 watch will do that. If we buy the $100 dollar watch and use the remaining money to help the poor, it would be a great service to society.